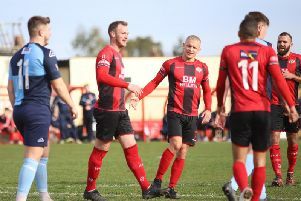 Kettering Town were given a timely reminder that they won’t have things all their own way in the Evo-Stik League South Premier Division Central after they were forced to settle for a dramatic 4-4 draw with Redditch United at Latimer Park. If you were a neutral, you got your £10 worth but if you were a fan of either side you would have been forgiven for missing a lot of the action due to having your head in your hands. For all the talk of the Poppies’ outstanding defensive record so far this season, they left it all in the dressing-room on this occasion as they were opened up at will by an in-form Redditch side in the first half. Kettering, to their credit, did haul themselves back into things with Dan Holman showing again just why the club have invested in him as two more goals, the second of which was sublime, gave the Poppies a 4-3 advantage. But, instead of seeing things out, they coughed up a couple of points with 30 seconds left of stoppage-time when the visitors grabbed a deserved equaliser from a corner. There were few arguments with Redditch good value for their point, particularly after a fine first-half display. The Poppies remain clear at the summit, although their lead was cut to three points. But things will need to tighten up drastically after they were exposed as a defensive unit in the opening period. Things started brightly enough and it looked like business as usual when Aaron O’Connor nodded the hosts in front after Holman had headed Dion Kelly-Evans’ delivery back across the face of goal. But Redditch had already shown some signs of what they were capable of and they exploded into the game when, after being allowed to shift the ball from left to right far too easily, David Reynolds converted a cross into the area. O’Connor had the ball in the net again, only to be denied by an offside flag but the Poppies were then all at sea from a left-wing corner. Robbie Bunn delivered it and Richard Batchalor was all alone in the six-yard box and had the simple task of scoring from close-range. Kettering hit back and they made it 2-2 when Kelly-Evans converted Gary Stohrer’s cross to the far post with a neat side-footed volley. But, almost immediately, Redditch were awarded a penalty when former Corby Town man Shaquille Leachman-Whittingham was upended by Durrell Berry in the penalty area. Leachman-Whittingham stepped up but Paul White produced an excellent stop to his left. Not even that was the spark Kettering needed though and they went into the break 3-2 down when Leachman-Whittingham found Bunn in acres of space and he had all the time in the world to pick his spot. O’Connor had an early second-half effort saved but it was the introductions of Rhys Hoenes and Lindon Meikle that really swung the game back Kettering’s way. Hoenes won a penalty just five minutes after coming on as he was hauled down by Redditch goalkeeper Reece Francis after he had spilled a shot into the winger’s path. Hoenes stepped up to take it but got it horribly wrong and, after trying to send the goalkeeper the wrong way, proceeded to simply roll it the ball into his grateful arms. Nonetheless, Kettering continued to press and they grabbed the equaliser with 15 minutes to go when Holman glanced home an inch-perfect free-kick from Marcus Kelly. If that was good, it got a whole lot better on 82 minutes. A corner was cleared only as far as Stohrer who lofted the ball back into the area. And while everyone else stopped, Holman came alive. He took the ball down with his first touch and then lobbed it over Francis with his second. A million dollar finish you might say. Unfortunately, there was still time for some 10 cent defending. The Poppies’ game management was poor. Numerous opportunities to run the ball into the corner during five minutes of stoppage-time were wasted. And you could almost sense what was coming when Redditch won a corner with just seconds remaining. The delivery was good and the header from substitute Harry Franklin proved too good for White as the ball nestled in the corner. This wasn’t a night that would please any defensive coach but would delight anyone looking for a bit of entertainment. The Poppies will be frustrated but, at the same time, this would have been a game they would have lost in previous campaigns. Poppies: White; Towers, Berry, Rowe-Turner (sub Hoenes, 59 mins); Kelly-Evans, Milnes (sub Meikle, 59 mins), Richens, Kelly, Stohrer; O’Connor (sub Solkhon, 85 mins), Holman. Subs not used: Graham, Kauzeni. Redditch: Francis; Ashmore, Evans, Parsons, Mills; Loveridge (sub Franklin, 77 mins), Batchalor, Bunn, Butterfield (sub Howards, 83 mins); Reynolds (sub Piggon, 67 mins), Leachman-Whittingham. Subs not used: Sinclair, Nelson. Goals: O’Connor (14 mins, 1-0), Reynolds (18 mins, 1-1), Batchalor (22 mins, 1-2), Kelly-Evans (30 mins, 2-2), Bunn (45 mins, 2-3), Holman (75 mins, 3-3), Holman (82 mins, 4-3), Franklin (90 mins, 4-4). Bookings: Ashmore, Francis, Hoenes (all fouls). Northants Telegraph man-of-the-match: Dan Holman - This wasn’t a spectacular night for anyone in a red shirt but one thing that couldn’t be argued was that Kettering were a lot better going forward than they were defending. And when they needed a goal, that man came to the rescue. Holman’s general play was, on the whole, neat and tidy. But he was signed to score goals and he has certainly done that. A glancing header levelled things up at 3-3 and then a quite magnificent finish looked to have won it. His second goal was worthy of winning any game. Unfortunately, one lapse in concentration right at the death ensured it wasn’t to be this time.